Today in Masonic History William Angus Sutherland is born in 1874. William Angus Sutherland was an American politician, attorney and banker. Sutherland was born in Oakland, California on January 26th, 1874. He spent most of his childhood in San Francisco and Oakland. He attended Stanford University where he attained a law degree in 1898. In 1898, shortly after graduating, Sutherland was admitted to the California bar. He began practicing law in San Francisco and stayed there until 1901. 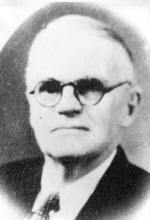 In 1901, he moved to Fresno, California and opened up the first of two legal practices with Frank H. Short. In 1899, Sutherland began a long standing association with the Bancroft-Whitney Company, publishing company. Through the Bancroft-Whitney Company Sutherland wrote several books regarding decisions of the United States Supreme Court and the California Supreme Court. In 1904 Bancroft-Whitney published Notes on the Constitution of the United States written by Sutherland. In 1910 the Bancroft-Whitney Company published a four volume set that Sutherland had written called A Treatise on Code Pleading and Practice. The books were widely used in California and other western states that required code pleading. In 1910, Sutherland was elected to the California State Assembly. He served two terms after being reelected in 1912. In 1911, Sutherland the official proponent of Proposition 12 which formed the California Railroad Commission, which is now know as the California Public Utilities Commission. In 1913 he authored legislation that took an early step to California's Community Property Law. This gave mothers and fathers joint custody of children and any earnings that those children made. Prior to the 1913 law, only a father had those rights. By 1912, the dominant industry in the Fresno area, the raisin industry, was in terrible shape. After many failed attempts to organize the farmers into a cooperative, several farmers and businessmen in Fresno working with Sutherland as their attorney formed the California Associated Raisin Company, which later was renamed Sun-Maid. During and after World War I, Sutherland entered the banking industry. He became the President and Vice President of various banking institutions in and around California. During his time in the banking industry he oversaw various mergers and acquisitions in the banks he worked in. Sutherland passed away unexpectedly on October 18th, 1935. He passed away form a heart attack while returning on a ship to California from Europe via the Panama Canal. Sutherland was a member of Las Palmas Masonic Lodge in Fresno, California. The lodge is now known as Las Palmas-Ponderosa No. 366.